In order to highlight their own apparent subjugation, some in the anti-vaccine crowd are now wearing Holocaust-era insignia. Yes, really. Anti-vaxxers, the movement of people who refuse to vaccinate their children because they an unfounded and uneducated fear that said vaccines will cause autism in their children, have somehow become even more ignorant and repugnant. This is, of course, including the fact that these people, who do not understand the science of vaccines, view the neurodiverse as something worse than death. They would rather a dead child than an autistic child. They are almost single-handedly responsible for the resurrection of measles—a disease that was very close to being eradicated—in America and Australia. Now, they have taken their rhetoric one step further. 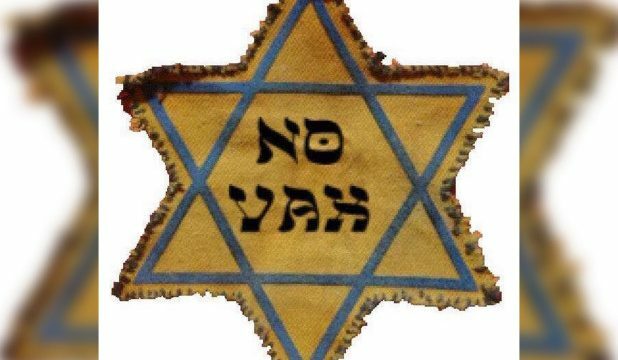 Like vegan activists before them using the Holocaust as an allegory for factory farming in “documentaries” like Earthlings and other messaging, the anti-vax movement has adopted the yellow star as its own symbol. Yes, that’s right, the yellow Star of David that Jews were forced to wear in the lead up to and during the Holocaust is now being used by ignorant parents who see the opposition to their movement as similar to German persecution of the Jews. Except they did a little make-up job on them. Rather than saying “jude”, the German word for “Jew”, they have written “No Vax” in Hebraically stylised letters. They claim they feel “persecuted” because their children have been banned from certain public spaces if they’re unvaccinated due to measles outbreaks—which, it cannot be stressed enough, haven’t happened in decades because we have vaccines. Worse, some of the recent measles outbreaks can be traced back to Orthodox Jewish communities, according to the Times of Israel. The one paper they relied on for proof was discredited so thoroughly that it’s honestly embarrassing that anyone still cites it. It’s not a “jury’s out” situation. The jury released their verdict, and the case is closed. When the museum dedicated to the memory of the symbol you’re co-opting burns you that bad, perhaps you should reconsider your use of that symbol. “There is some likely unintentional genius behind anti-vaxxers choosing this symbol,” author and comedian James Schlarmann wrote. And, as harsh as that is, he has a point. Leaving your own children unvaccinated doesn’t only endanger them, leaving them open to diseases they would otherwise be able to live freely without contracting, but they weaken the safety net of herd immunity created by having a high number of vaccinated people. There are people in this world who cannot be vaccinated, for one reason or another, or those on whom the vaccine is less effective, and they are protected by those around them being vaccinated. For example, babies too young to be vaccinated. They are the ones who caught measles most recently in NSW. It’s worse because, like smallpox, measles was effectively gone forever. But now, because the herd was weakened before the disease disappeared, it’s had a chance to come back with a vengeance. It’s important to stress at this point that vaccines do not cause autism. They have proved it so definitely that at this point the only people who don’t know that are being wilfully ignorant. The one paper they relied on for proof was discredited so thoroughly that it’s honestly embarrassing that anyone still cites it. And no, it’s not a “jury’s out” situation. The jury’s in, they released their verdict, and the case is closed. And finally, not to put too fine a point on it, but these parents’ attitudes towards autism and the neurodiverse have a lot more in common with the enforcers of the yellow star than with those who were forced to wear it. If you believe a dead child is better than an autistic child, perhaps you need to re-examine just what exactly is wrong with you.